Drager, Derek C.. "Denis Potvin". The Canadian Encyclopedia, 16 December 2013, Historica Canada. 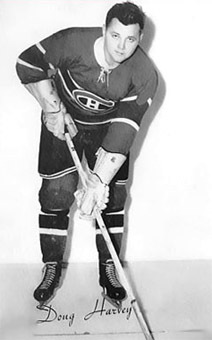 https://www.thecanadianencyclopedia.ca/en/article/denis-potvin. Accessed 23 April 2019. Denis Charles Potvin, hockey player (b at Ottawa 29 Oct 1953). After a junior career with the Ottawa 67s, Potvin was the first player chosen in the 1973 NHL draft. Denis Charles Potvin, hockey player (b at Ottawa 29 Oct 1953). After a junior career with the Ottawa 67s, Potvin was the first player chosen in the 1973 NHL draft. He earned the CALDER TROPHY as a New York Islander rookie in 1974 and went on to become a great playmaking defenceman and leader of the Islander team that won the STANLEY CUP 4 times (1979-83). He was awarded the JAMES NORRIS MEMORIAL TROPHY in 1976, 1978 and 1979, and he played on 2 CANADA CUP teams (1976 and 1981). 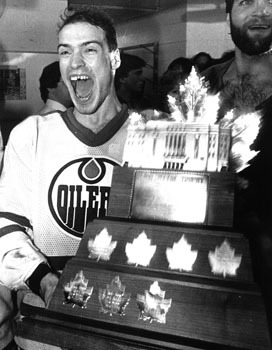 He retired after the 1987-88 season, his 14th NHL campaign. His totals of 310 goals, 742 assists and 1052 points established new NHL records for defencemen, eclipsing the marks set by Bobby Orr. He also had 56 goals, 108 assists and 164 points in 185 play-off games, again the highest totals for a defenceman in history. Potvin was elected to the Hockey Hall of Fame in 1991. Following retirement he served as a colour commentator for the Florida Panthers, a position he held from 1993 to 2009.